Guion (Guy) Bluford was born in 1942. He is mostly known for his career in NASA as an astronaut. 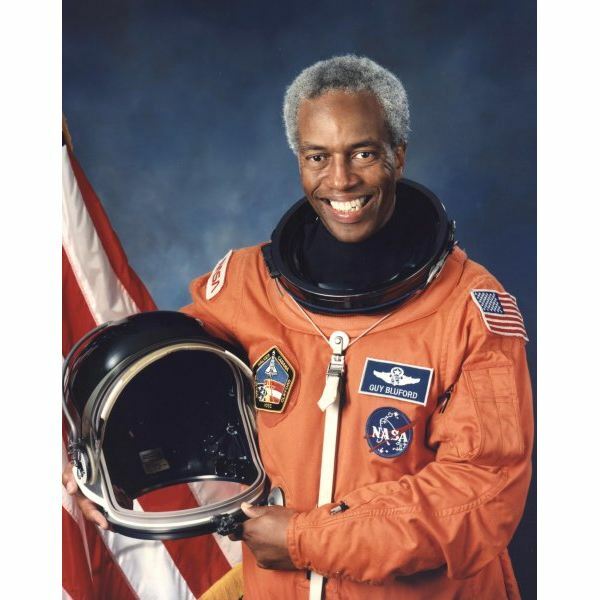 Bluford has also served in the United States Air Force and he is also known as the first African American to have traveled in space. Family Status: His mother was a special education teacher and his father was a mechanical engineer. Married to Linda Tull. They have two children, Guion III and James. Hobbies: Reading, swimming, jogging, racquetball, handball, scuba diving and golf. 1987: A master in business administration (University of Houston, Clear Lake). 1967: Bluford becomes a T-38A instructor pilot for the 3630th Flying Training Wing, Sheppard Air Force Base, Texas, serving as a standardization officer and as an assistant flight commander. 1971: He becomes an executive support officer to the Deputy Commander of Operations and a School Secretary for the Wing. 1974: He becomes a staff development engineer in the Air Force Flight Dynamics Laboratory at Wright-Patterson Air Force Base in Ohio (deputy for advanced concepts for the Aeromechanics Division and branch chief of the Aerodynamics and Airframe Branch). 1993: He leaves NASA and takes a post of Vice President/General Manager, Engineering Services Division, NYMA Inc., Greenbelt, Maryland. 1997: He becomes Vice President of the Aerospace Sector of Federal Data Corporation. 2000: He becomes Vice President of Microgravity R&D and Operations for the Northrop Grumman Corporation. 2002: He becomes President of the Aerospace Technology Group, an engineering consulting organization in Cleveland, Ohio. On August 30, 1983, the STS-8 mission was launched from Kennedy Space Center. It was the first mission with night launch and landing, and it was also the first mission for Bluford. During the STS-8, several medical experiments were conducted regarding the effect of space flight on the human body. The mission lasted 145 hours and during this time the shuttle Challenger completed 98 orbits around the Earth. On October 30, 1985, STS-61-A launched from Kennedy Space Center aboard Challenger. 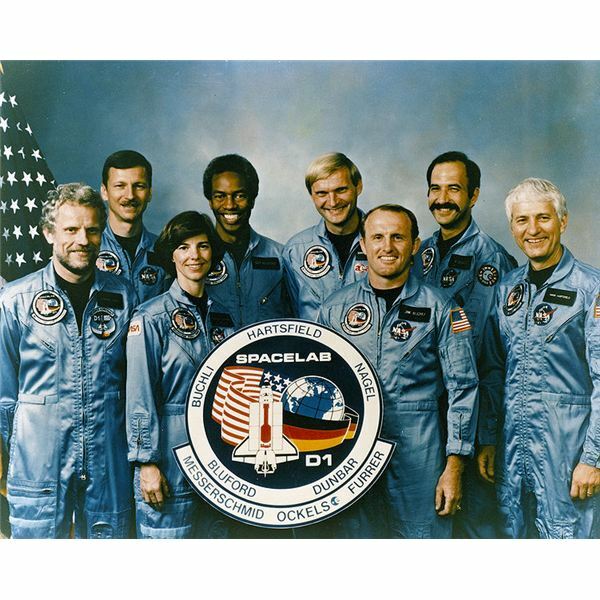 Eight members of the crew, along with Bluford performed 76 experiments in Spacelab. The mission lasted 169 hours and completed 111 orbits. In April 28, 1991, Bluford participated in the STS-39 mission, launched from Kennedy Space Center aboard Discovery. The mission lasted 199 hours and completed 134 orbits. On December 2, 1992, STS-53 launched from the Kennedy Space Center, Florida aboard Discovery. The mission lasted 175 hours and completed 115 orbits. This was the fourth and last mission Bluford participated in. 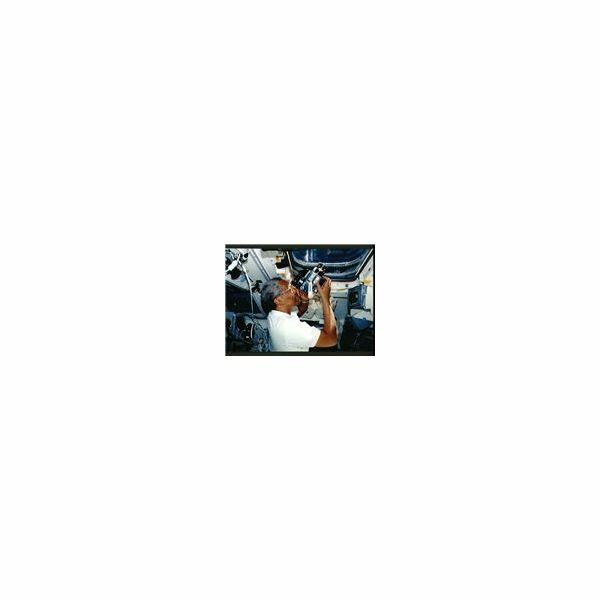 Image: Guion Bluford in the aft flight deck photographing the Earth during the STS-053 mission. The photo was taken on December 9, 1992. Bluford was the first African American in space. He has more than 688 hours in space. He flew 144 combat missions, 65 of which were over North Vietnam. He has written several scientific papers in the field of computational fluid dynamics. He is a certified scuba diver. He has an FAA commercial pilot license. He has over 5,200 hours jet flight time in the T-33, T-37, T-38, F-4C, F-15, U-2/TR-1, and F-5A/B, including 1,300 hours as a T-38 instructor pilot. Bluford was included in the list of 100 Greatest African Americans in 2002. He was selected as the Grand Marshal of Penn State in 2006. He was inducted into the International Space Hall of Fame in 1997 and the United States Astronaut Hall of Fame in 2010.